A two-part series entitled "The Libya Gamble" published in the Sunday and Monday editions of the New York Times is a damning indictment of Hillary Clinton, the former secretary of state and current front-runner for the Democratic presidential nomination. The Times has endorsed Clinton's presidential campaign, describing her as "one of the most broadly and deeply qualified presidential candidates in modern history" and as a president who "would use American military power effectively." The paper has helped promote the political propaganda touting her as a feminist icon and a candidate deserving the support of African-Americans. No one would suspect that Ms. Clinton's criminal record makes her the political equivalent of a black widow spider. Even the Libya piece suggests that her pivotal role in instigating the US-NATO war of 2011 casts a favorable light "on what kind of president she might be." It describes her as a "diligent student and unrelenting inquisitor, absorbing fat briefing books, inviting dissenting views from subordinates, studying foreign counterparts to learn how to win them over. She was a pragmatist, willing to improvise..."
Today, as the article notes, Clinton deflects questions about the war with bromides about the Libyans having participated in two elections—which have produced what are now three competing governments, none of which can claim to rule any significant part of the country enmeshed in a bloody civil war. It is "too soon to tell" how things will evolve in Libya, she adds, five years after the war and under conditions in which Washington is once again deploying special operations troops on the ground and bombing the country from the air. The article acknowledges that Clinton had fought within the Obama administration against "dropping support for Hosni Mubarak" under conditions in which the masses of Egypt had risen up in a revolutionary struggle against the US-backed dictator. Yet somehow in Libya, the article argues, "Clinton had a new opportunity to support the historic change that had just swept out the leaders of its neighbors Egypt and Tunisia. And Libya seemed a tantalizingly easy case—with just six million people, no sectarian divide and plenty of oil." Here the phrases "tantalizingly easy" and "plenty of oil" were the operative ones in Clinton's real calculations. A regime change operation was mounted against the Libyan government of Muammar Gaddafi not to further the revolutionary upheavals that were dubbed the "Arab spring," but rather to contain them by imposing a US-controlled puppet state in the country separating Egypt and Tunisia, and asserting unfettered Western control over Africa's largest oil reserves in the bargain. The article establishes that Clinton "pressed for a secret program that supplied arms to rebel militias," composed largely of Islamist groups, some with direct ties to Al Qaeda. Within the administration, the Times reports, she pressed for direct US military intervention on the grounds that the British and French governments would go ahead without the US and Washington would be "left behind" and "be less capable of shaping" the scramble for control of Libya and its oil wealth. The pretext, that Libyan government forces were on the verge of a "genocidal massacre" of "protesters" in the eastern city of Benghazi, was subsequently refuted by international human rights groups, and the total number killed in armed clashes before the US and NATO began their bombing of Libya amounted to barely 350. At the outset of this bombing campaign, the article recounts, numerous attempts were made by Libyan officials, UN functionaries, other African governments and the African Union to negotiate a ceasefire and a political settlement, all of which were rejected by Washington. Charles Kubic, a retired rear admiral who received a proposal from a top Libyan military officer for a 72-hour ceasefire, was told by the US military command to immediately cut off the discussion based on orders that had come from "outside the Pentagon." "The question that stays with me is, why didn't you spend 72 hours giving peace a chance?" he told the Times. The obvious answer was that those who had promoted the Libyan intervention, with Clinton in the lead, were determined to have their war for regime change fought to a bloody conclusion. That came in October 2011 with the vicious lynch-mob murder of Gaddafi by the US-backed Islamist "rebels." After watching a video on an aide's BlackBerry of the Libyan leader being beaten and sodomized with a bayonet before he was killed, Clinton exclaimed "Wow!" She then infamously turned to her television interviewer, exclaimed "We came, we saw, he died!" and cackled in delight. As the article makes clear, these bloody crimes were viewed by Clinton and her supporters as grist for her 2016 presidential campaign. 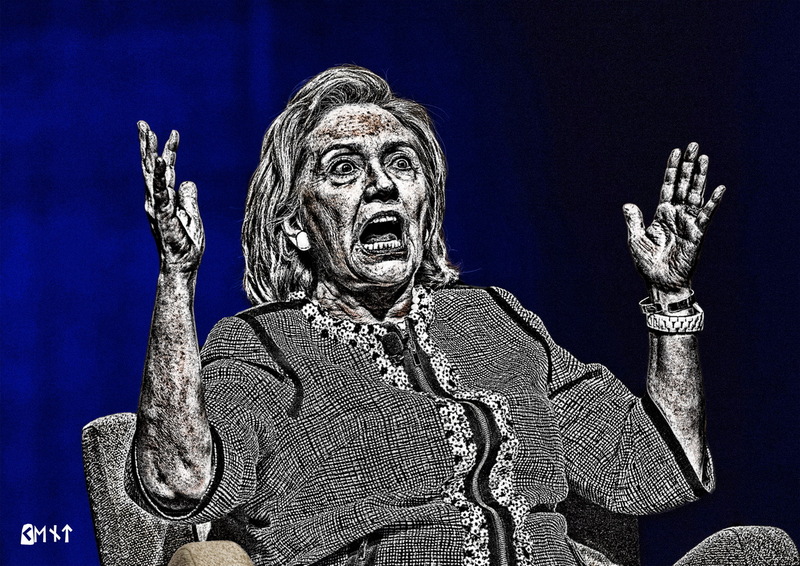 Her top aide at the State Department issued a memo stating that the record demonstrated Clinton's "leadership/ownership/stewardship of this country's Libya policy from start to finish." "The memo's language put her at the center of everything," the article states: "'HRC announces ... HRC directs ... HRC travels ... HRC engages,' it read." In the aftermath of the catastrophe in Libya, the article credits Clinton with "pushing for an aggressive American program to arm and train Syrian rebels trying to topple President Bashar al-Assad." After rivalries and recriminations between the agency and the Islamists erupted in the September 11, 2012 attack on the US facilities in Benghazi that killed the US ambassador and three security personnel, Clinton came under Republican fire, not for waging an illegal war, assassinating a foreign leader or arming Al Qaeda, but for an alleged "cover-up" of the Benghazi incident. Similarly, a continuing investigation has been mounted over Clinton's use of a non-secure private email server which handled material deemed secret, but little attention has been paid to the content of these emails, which again implicate Clinton in the bloody crimes carried out in Libya, Syria and beyond. Summed up in Clinton's role in the Libyan events is the arrogance and recklessness of a US foreign policy that is inseparable from militarism and aggression. In Clinton's shameless attempt to exploit events that killed tens of thousands and turned millions into refugees to further her grubby political ambitions, one finds a consummate expression of the degraded character of the American ruling elite and its political system as a whole, and of the Democratic Party in particular. had this look on her face. I kid you not.